Maximum efficiency: Powerful liquid-cooled 475 cc four-stroke engine is longitudinally mounted, allowing direct driveshaft alignment to both front and rear wheels for maximum drivetrain efficiency. Compact engine: Overhead-valve design provides compact engine dimensions for improved ground clearance while maintaining a broad, easy-to-use powerband. Easy start: Convenient electric starting, with an automatic internal-decompression system, gets you going quickly and easily. Fuel efficient: Programmed Fuel Injection (PGM-FI) system improves power delivery and throttle response, and increases fuel efficiency for extended range. Excellent drivability: Super-heavy-duty automatic clutch with low-rpm engagement for excellent drivability and towing capacity. Trail ready: 2WD/4WD system offers three drive modes: 2WD; 4WD with torque-sensing front differential; and 4WD with locked front differential to optimize traction. The system also features a Speed Override mode that can be engaged when the front differential is locked, which allows increased wheel speed under severe conditions, such as deep mud. 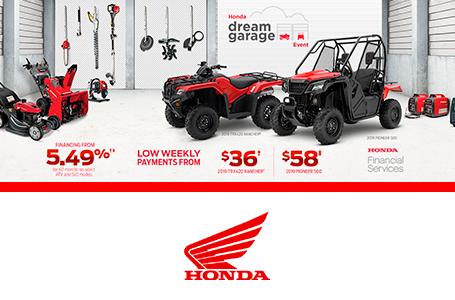 Smooth shifting: Five-speed transmission with ultra-low first gear features Honda's exclusive Electric Shift Program (ESP) for easy shifts with the touch of handlebar-mounted buttons. Powerful output: Powerful AC generator has generous capacity with 481 watts of output. Strong and lightweight: Durable double-cradle steel frame developed with Computer Aided Engineering is both rigid and lightweight for precise handling and a smoother ride. Great control: Front and rear suspension both offer 185 mm (7.3 in.) of travel for a plush and controlled ride. Adjustable spring preload on all shocks allows suspension to be tuned to match varying loads and riding conditions. Durable design: Enclosed-axle swingarm offers optimized stiffness for improved toughness and excellent handling performance. High quality: Sealed steering-knuckle bearings improve performance with durable, tear-resistant Plastic CV joint boots. Superb comfort: Rubber swingarm pivot bushings provide excellent low-speed ride comfort and increased durability. Optimal ground clearance: Generous ground clearance of 191 mm (7.5 in.) 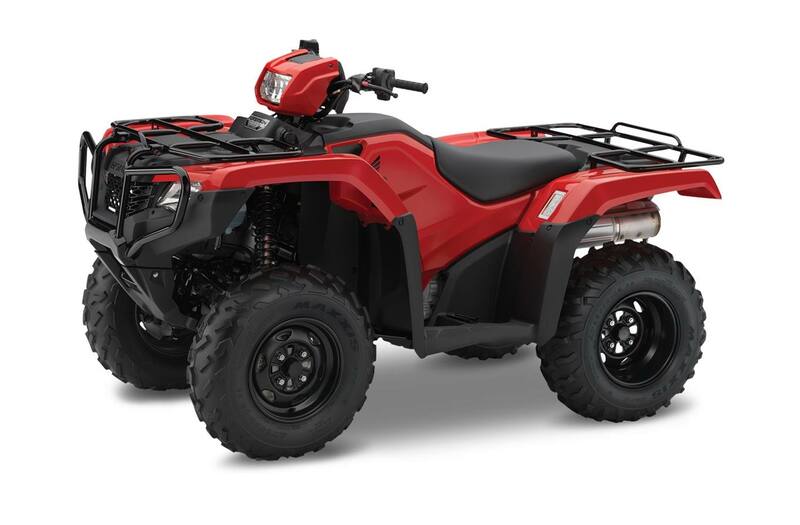 allows you to ride over rugged terrain with ease. Impressive power steering: Electric Power Steering (EPS) reduces steering effort for enhanced manoeuvrability and decreases kickback for improved all-around steering action. Stopping power: Rear drum brake is located inside the right rear wheel for improved durability and increased ground clearance. Dual front hydraulic disc brakes with large 190 mm rotors provide strong and consistent stopping power. Protective bodywork: Durable bodywork provides excellent mud and debris protection. Strong visibility: Twin-headlight system features 35-watt headlights with focused light distribution for improved visibility after dark. Top assist light operates independently of front headlights so it can be turned off while carrying a load on the front carrier. Easy maintenance: One-piece tank/side cover allows easy access for maintenance with no tools required. The fuel pump derived from Honda automobile technology is mounted in the fuel tank for better heat isolation and increased filter life. Added protection: Full-length synthetic lower skidplate with integrated front brush guard protects against damage from rocks, sticks and other obstacles. Versatile towing ability: Load capacity for front and rear carriers is 40 kg (88 lbs.) and 80 kg (176 lbs.) respectively. The heavy-duty trailer hitch has a 385 kg (848 lbs.) towing capacity. Multi-functional: A host of optional accessories allow you to tailor your TRX500 to your needs.